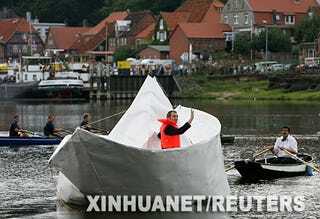 Artist Frank Boelter has constructed a 9-metre paper boat from the stuff used to make Tetrabrik packs and is sailing it up the Elbe. The 37-year old artist came up with the idea one breakfast time, while he was sitting at his kitchen table fiddling with an empty milk carton, which he cut up and made into a scaled-down model. See how they built it after the jump.